Behave yourself, KidRiot is watching! Take a good look at Kidrobot’s iconic figure as envisioned by Kansas City artist MAD, and show the man the proper respect…or pay the price. MAD’s KidRiot is 8 solid inches of crowd-controlling vinyl, complete with removable tactical helmet and shield, glazed strawberry donut, and a skull-crushing baton (nicknamed “The Judge” for obvious reasons). The Blot’s been waiting for this figure’s release for almost a year, and it’s definitely been well worth the wait! 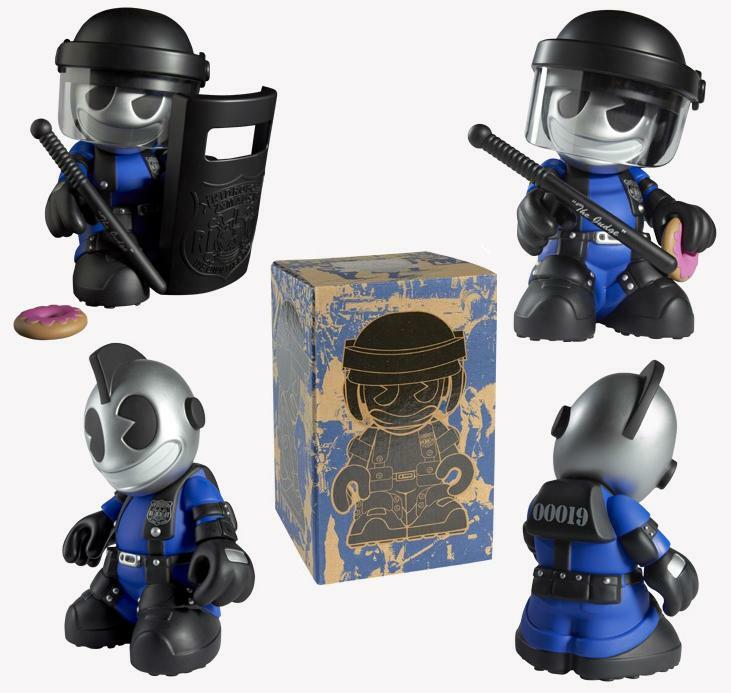 The details on this Kidrobot mascot figure look topnotch and I love all of KidRiot’s accessories, especially his glazed donut! KidRiot rules the mean streets with an iron fist, but don’t let fear hold you back because KidRiot will be in limited supply! Only 1,500 were produced and with a retail price of $60 you know these will sell quickly. 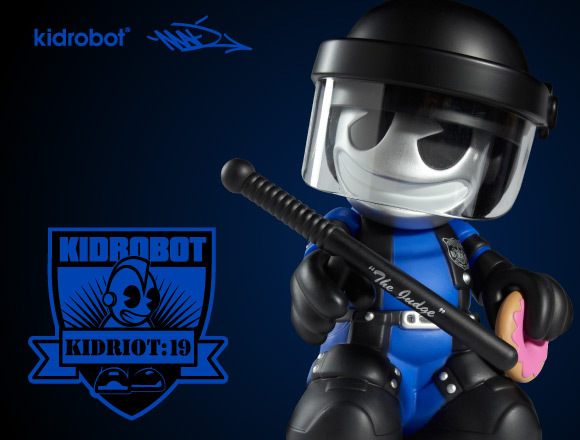 Kidrobot 19: KidRiot by MAD goes on sale May 12 at all Kidrobot stores, kidrobot.com and specialty retailers. 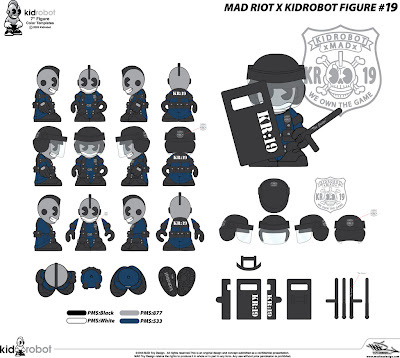 To coincide with the release of the Kidrobot 19: KidRiot vinyl figure, MAD will be going on a three city signing tour (like this figure needs any additional promotion). This cross-country mission will infiltrate Kidrobot Los Angeles on Thursday, May 12th, San Francisco on Friday, May 13th, and Miami on Saturday, May 14th. All three events will take place from 6-8pm, but get there early because you know MAD will pack the house! Yesterday, Entertainment Earth announced Bif Bang Pow!’s San Diego Comic-Con 2011 Exclusive LOST Bobble Head will be the Dharma Polar! How crazy is that!?! Deftly crafted out of resin, this sensational Dharma Polar Bear bobble head stands 5.5” long x 4.25” tall x 2 .5” wide, and features superb show accurate details. Wearing a Dharma Initiative collar, this “killer” bobble head stands ready to strike on a base featuring a cage wall and a fish biscuit. I mean come on, the fish biscuit alone makes this a can’t miss SDCC exclusive! It’s hard to believe it’s been 2 whole years since Bif Bang Pow! released its very first LOST bobble head at San Diego Comic-Con 2009. Where has the time gone!?! Sadly, this will be the toy company’s 12th and final LOST bobble head. I was really bummed to learn this will be the company’s last LOST release, but at least the line is going out with a bang! It’ll be interesting to see if anyone else picks up the show’s license. 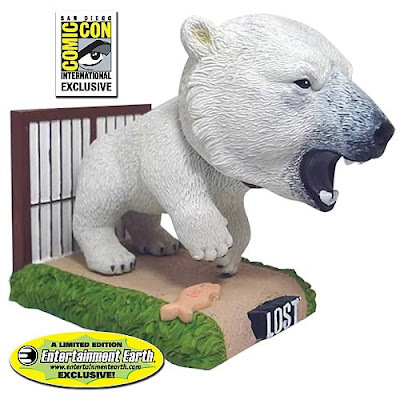 If you’re planning to attend SDCC 2011, be sure to stop by the Entertainment Earth booth to pick up the LOST Dharma Initiative Polar Bear Bobble Head by Bif Bang Pow! For the rest of us, you can pre-order one here from EntertainmentEarth.com for $14.99. 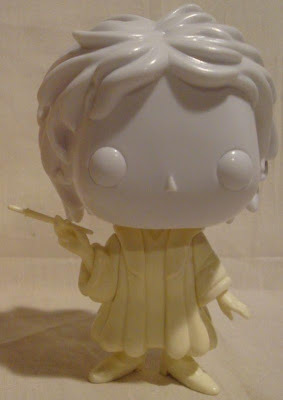 The resin figure won’t ship until August 2011, but it’ll definitely be worth the wait. Man, the surprise releases just keep on coming! 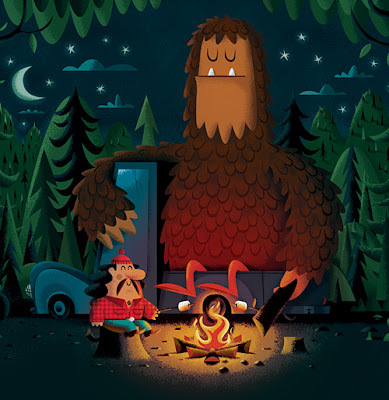 Invisible Creature announced on Wednesday that Salvatore and George, the lovable mascots IC created for the Sasquatch! Music Festival’s 10th anniversary, would be released this summer as vinyl figures! Salvatore stands 4″ tall while George packs a TON of detail into an impressive 2″. The two characters come as a set and will be available in person (along with a few limited-edition prints) on May 19th at Velocity Art & Design in Seattle, WA. 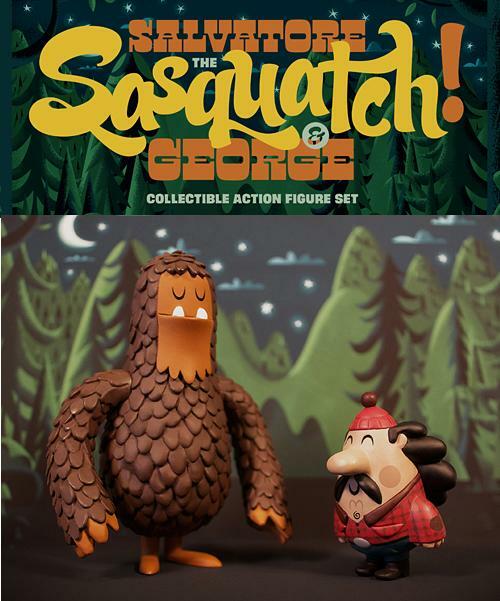 Don’t worry if you can’t make it Invisible Creature’s show on the 19th, this 2 figure set will be available for pre-order soon and at the Sasquatch! Music Festival May 27-30. More details to come! 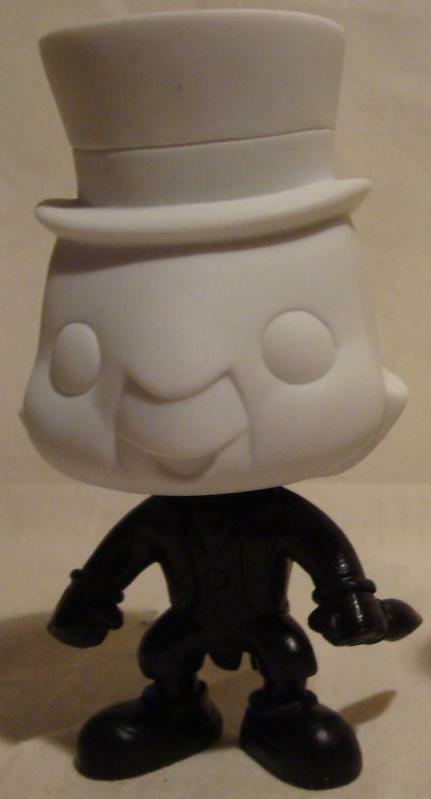 A little birdy (or was it a mouse) sent me this official first look at Funko’s upcoming line of Disney Pop! Vinyl Figures! As you know, The Blot’s been looking forward to this new Pop! Series and I am really excited to debut the toy line’s official line-up. Pop! 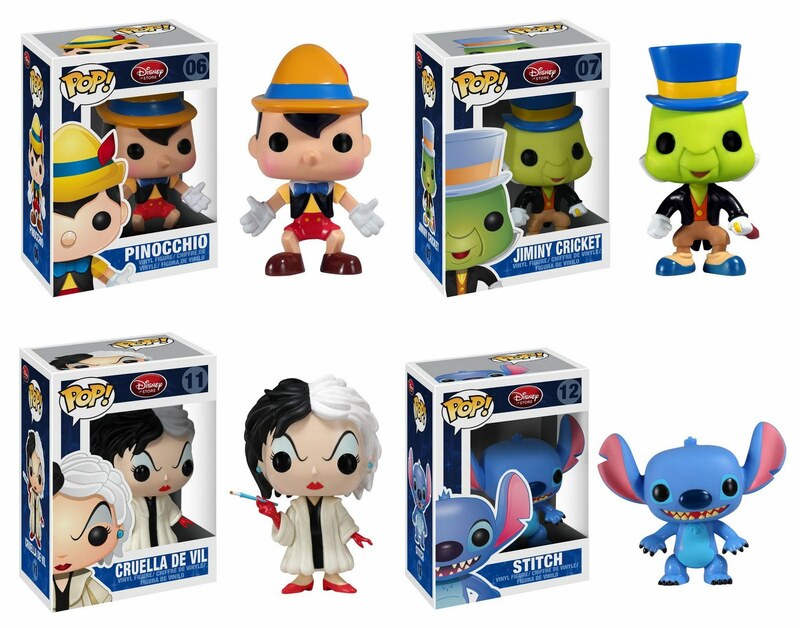 Disney Wave 1 features Mickey Mouse, Tinkerbell, Snow White, Toy Story’s Woody and Buzz, Monsters Inc.’s Sully and Mike, Pinnochio, Jiminy Cricket, Stitch, and villains Cruella de Vil and Maleficent. What I really like about Funko’s first wave of Pop! Disney vinyl figures is the huge variety of classic characters and new Pixar favorites included in the series. From Mickey and Snow White, to Stitch and Buzz, almost every era of Disney magic is accounted for. And with Disney’s huge roster of characters, this is one Pop! line that could go on indefinitely! Pop! Disney Wave 1 includes 12 figures in all and from the looks of the packaging, will be sold exclusively at Disney Stores worldwide. 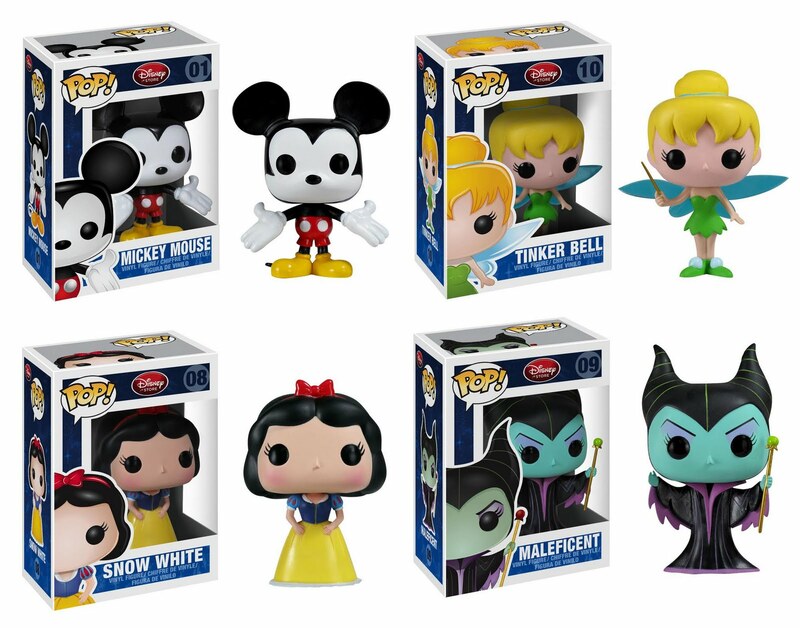 Look for these cute and blocky Disney vinyl figures in a Disney Store near you sometime soon! The Blot’s started to wonder when Detroit artist D-Lux sleeps! The man has been a painting machine these past few months, releasing more and more killer custom painted kaiju, sofubi and most Super7 figures. Last Sunday, D-Lux released an entire series of Easter inspired customs in honor of the holiday and they are sick! D has truly transformed some of The Blot’s favorite figures with these vibrant and pastel color schemes. 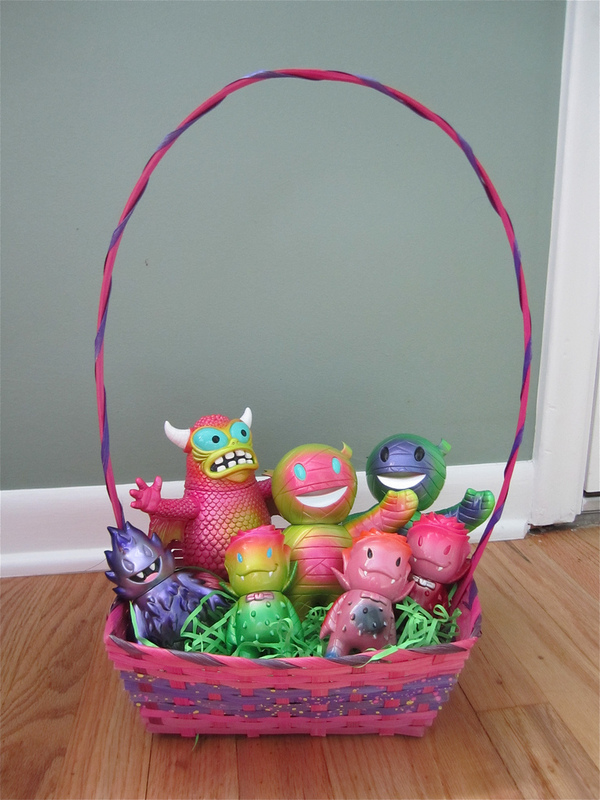 Just look at these Rose Vampires, Mummy Boys and Partyballs given the "Easter" treatment by D-Lux! And don’t even get me started on the Neon Metallic Pink 1988 Greasebat. I think that’s my favorite of the bunch, but I know a lot of comic book fans will love D-Lux’ green and purple color scheme on his Incorrigible Hulk Mummy Boy. Most of the customs you see here (and more), are currently available for sale at D-Lux’s online store. Ranging in price from $80-175 each, these one of a kind custom figures will make the perfect centerpiece to any collection! Even better still, D is currently holding a pretty sick promotion. Anyone who makes a purchase through his online store will be automatically entered to win a free custom or proto black Super7 Foster vinyl figure! How cool is that? 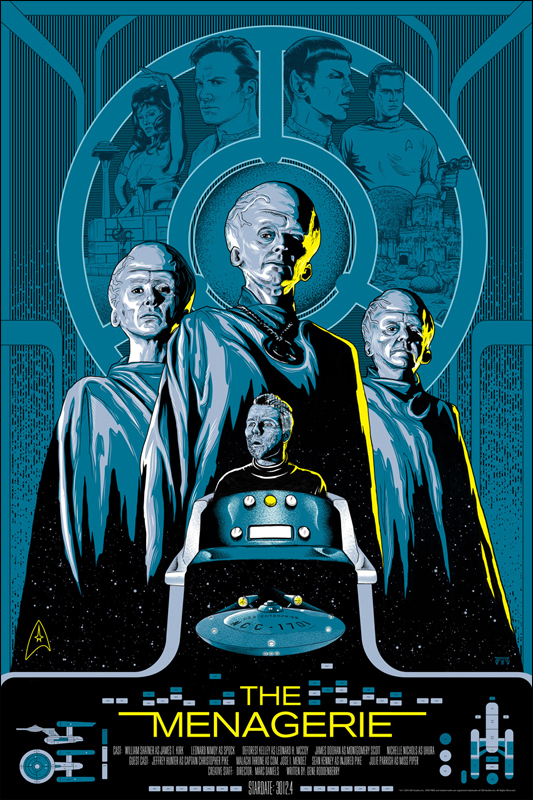 The Blot had started to think Mondo had ended its Star Trek Screen Print Series without an official announcement. 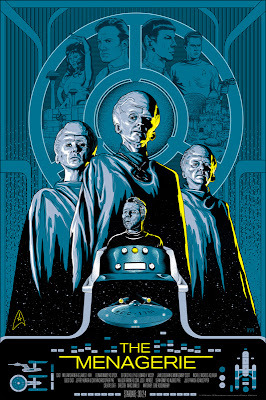 It had been all most 2 months since we saw a Star Trek release, and then BAM!, two prints in one day! The first Star Trek screen print scheduled to be released today (sixth overall) is “Mirror, Mirror” by Tomer Hanuka, which is named after the 1967 The Original Series episode of the same name. The second print (and seventh overall) is “The Menagerie” by Mike Saputo, which is also scheduled for release today. 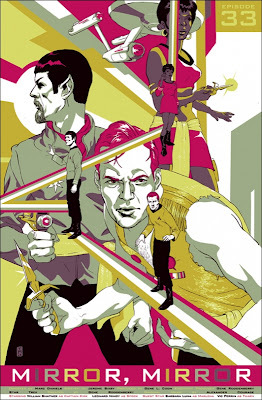 “The Menagerie” is based on the 1966 Star Trek: The Original Episode two-part episode of the same name. “The Menagerie” episode is unique in that it is the only two part episode of the original Star Trek television show. It also marks the return of Christopher Pike, who was the original captain of the USS Enterprise in the show’s pilot episode. "Mirror, Mirror" by Tomer Hanuka is a hand numbered 24″x36″ screen print, has a limited edition run size of 175 prints and retail for $45. "The Menagerie" by Mike Saputo is a hand numbered 24″x36″ screen print, has a limited edition run size of 125 prints and retail for $45. Both screen prints go on sale today, Thursday, April 28th, at the Mondo Tees online store at a random time. 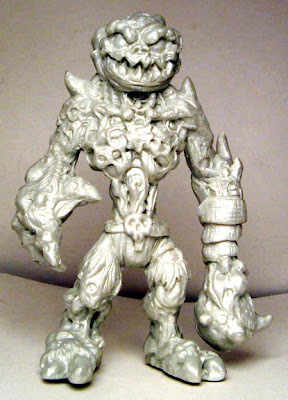 Andrew Bell first previewed the painted master resin sculpt of his upcoming O-No Sashimi vinyl figure in San Diego 2010…and then nothing! Well that all changed yesterday, when he unveiled the first official photo of this exciting new figure yesterday. While The Blot doesn’t know too many details, Bell did let it slip that the first opportunity collectors will have to catch his O-No Sashimi will be at SDCC 2011! 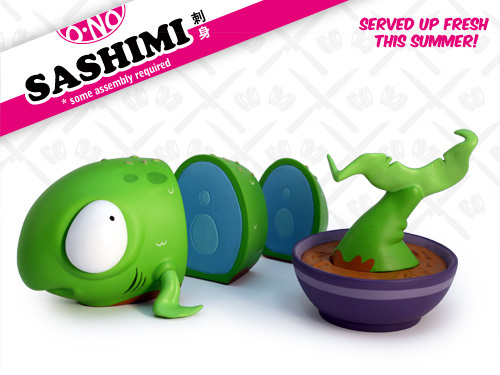 The Standard Edition Green O-No Sashimi will debut this summer in San Diego, along with a possible SDCC 2011 Exclusive colorway…any guess what color that might be? If you can't make it to San Diego this year, don’t worry! 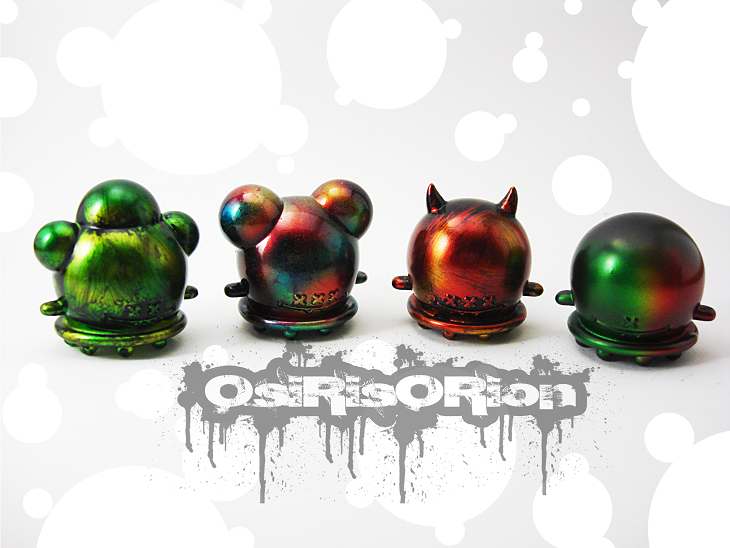 Andrew will definitely have some of the green O-No Sashimi colorway available online and in stores after SDCC 2011. More details to come for sure! The newest trailer for X-Men: First Class hit the internet today, and it's awesome! No really, it's great. It features the entire "first class" of Xavier's School for Gifted Youngsters (well the movie version that is), including our very first look at Banshee! That first team shot with everyone on the Blackbird in their blue and gold uniforms was just perfect. I can't wait to see the entire scene. I'm not sure why, but the film's trailers are as good, if not better, than its posters are bad. The discrepancy is really quiet strange. I seriously love this trailer, and if after watching it you're not totally stoked for X-Men: First Class, well something's wrong with you! 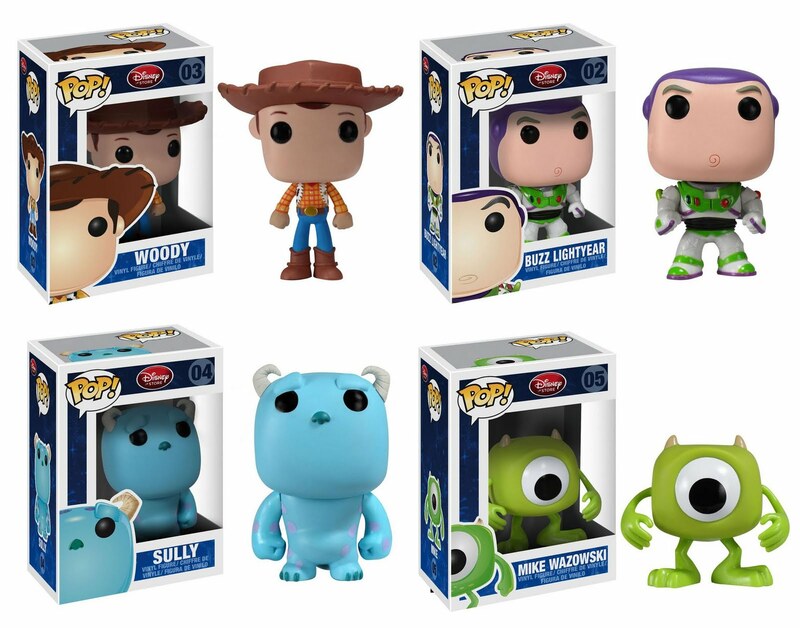 Still no official word concerning Funko’s upcoming line of Disney Pop! vinyl figures, but thankfully that hasn’t stopped the leaks from coming! Two more Disney Pop! 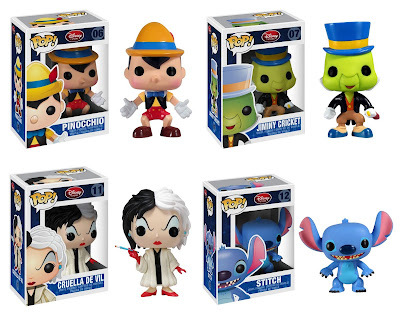 prototypes have hit the internet recently, Pinocchio’s Jiminy Cricket and 101 Dalmatians’ Cruella de Vil. While Jiminy was to be expected (who doesn’t love that cute little singing cricket? ), Cruella’s inclusion was a total surprise. Of all of the Disney Pop! prototypes The Blot’s seen so far, Cruella is the toy line’s first villain (but hopefully not its last). 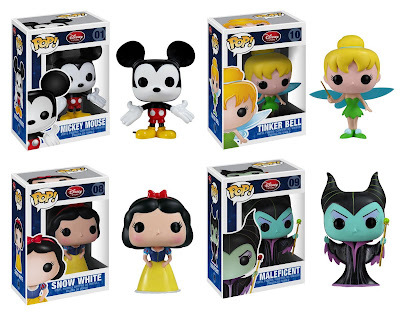 All in all, this marks 10 different Disney characters included in Funko’s new Pop! Disney vinyl figure toy line, and yet we’ve still heard nothing about an actual release date. Hopefully more details will be released soon, as Funko continues to release other new and relatively unannounced Pop! toy lines. Evidently, Thor has debuted a week early in select International theaters already, and The Blot had absolutely no idea! When was the last time a big budget American film first debuted anywhere other than in the US? Regardless, these early viewings mean the Marvel Comics film has already received a significant number of reviews on RottenTomatoes.com (34 in total) and currently has a 94% freshness rating! How great is that!?! Thor is definitely the comic book adaptation The Blot is looking forward to the most this summer, and I’m glad to hear the film is living up to its hype. To help get you in the mood for Thor’s North American theatrical release next week, check out the film’s latest one sheet movie poster. 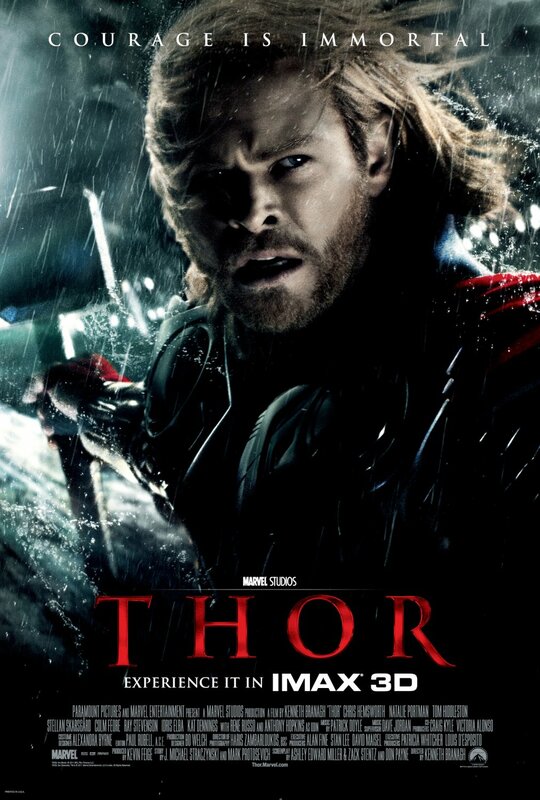 As the poster says, “Courage Is Immortal,” and so is Chris Hemsworth’s Thor! I just wish the marketing team of X-Men: First Class could take lessons from Thor’s marketing team. Every Thor one sheet is better than the last! 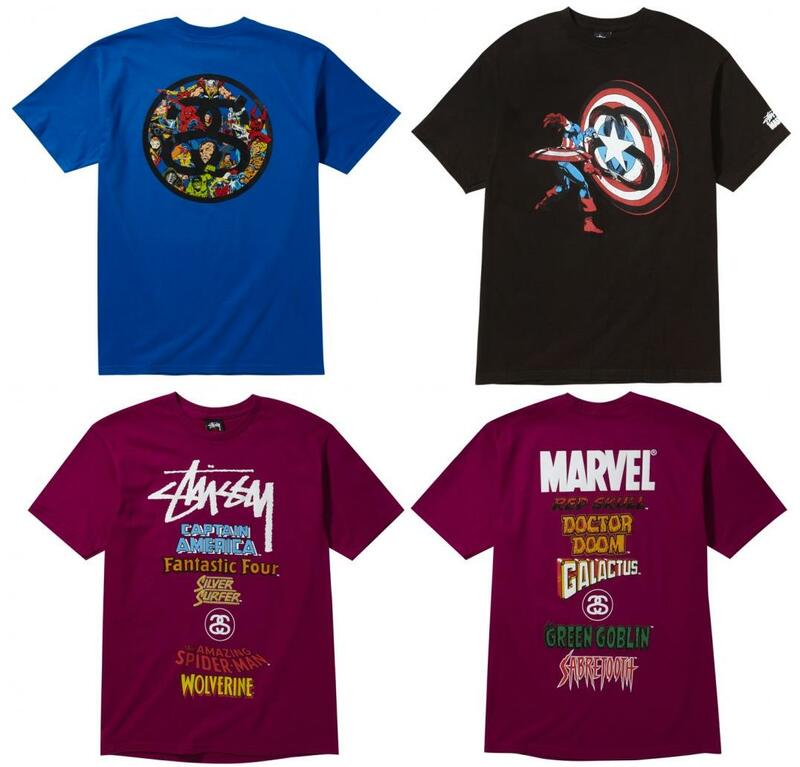 Last month The Blot blogged about Marvel Comics’ upcoming team-up with clothing brand Stussy. Well, the first release of that collaboration comes out this week, and the official line-up of the Marvel Comics x Stussy Clothing Collection Series 1 has finally been revealed! According to the official Stussy x Marvel website, “Stussy and Marvel Comics present a project featuring characters from the Marvel Universe that are transported into the Stussy world.” Whatever that means...is there really a Stussy world? Series 1 includes 9 different t-shirt designs, which combine vintage Marvel characters with definitive Stussy designs. 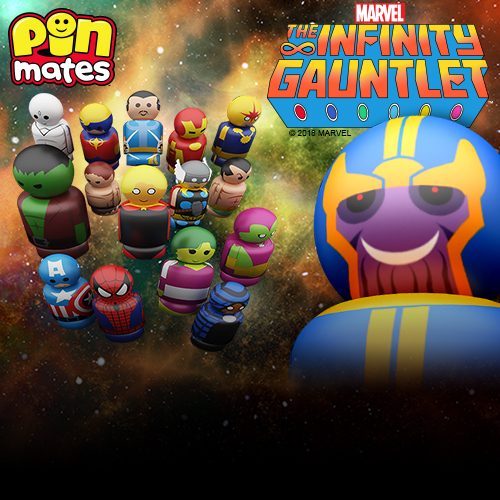 These styles feature images from rare and collectible comic books and posters, and include Marvel super heroes and villains such as Wolverine, Captain America, Silver Surfer, Punisher, Ghost Rider, Doctor Octopus and Doctor Doom. 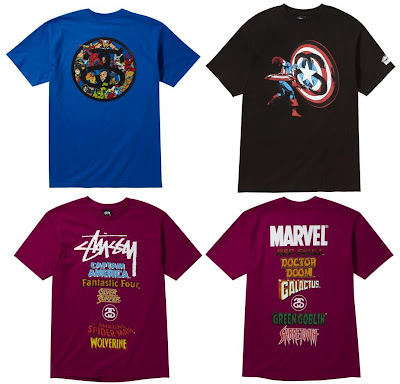 Stussy x Marvel Clothing Collection Series 1 will be released on Wednesday, April 27th and can be purchased at Stussy.com, Stussy Chapter Stores and boutiques worldwide. As you all know, Josh Herbolsheimer’s Rose Vampire has quickly become my favorite vinyl figure. 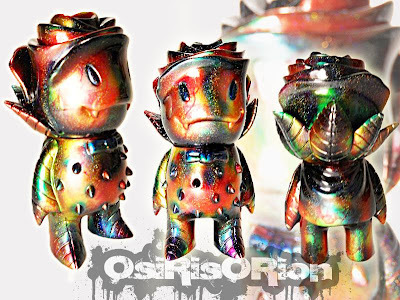 The Super7 Monster Family toy is also a pretty cool platform for customs, as you can tell from this beautiful Oil Slick custom by OsirisOrion! Osiris has been customizing like a mad man lately and each piece is seriously better than the last. The Blot especially loves seeing how Osiris’s signature Oil Slick paint job has been applied to a number of different figures recently, including a Grasebat, The Destroyer, Buff Monster Minis and The Outsider. What’s great about this particular style is how it accentuates each figure’s unique design, while adding depth and texture. If you don’t believe me, see more here at OsirisOrion’s flickr page. The 2nd Disney Afternoon Vinylmation 2-pack was released earlier this month, and it features characters from my favorite Disney television series, Ducktales. The Blot still knows every word to the show’s opening theme song by heart! How in the world Ducktales, with its huge cast of characters, has not made a comeback is beyond me. Someone at Disney needs to get on this STAT! 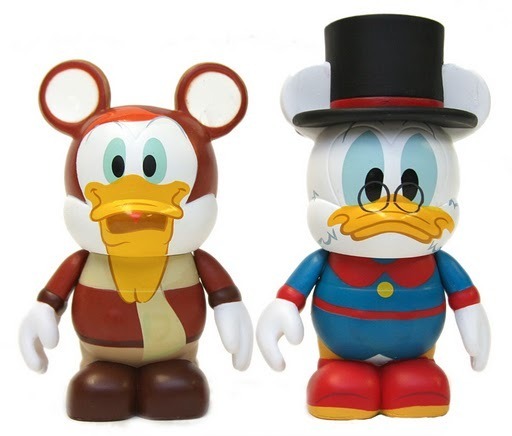 The Ducktales Disney Afternoon Vinylmation 2-pack includes Scrooge McDuck and Launchpad McQuack, retails for $26.95 each, and has a limited edition run size of 1,000 sets. While already on sale at D-Street locations in California and Florida, The Blot has not seen this set show up at DisneyStore.com yet. Medicom finally announced what we’ve known for a while, that the Japanese toy company will be releasing a 10” vinyl figure of Josh Herbolsheimer’s Earth Wolf! The Blot’s a huge fan of Josh’s artwork, and his Rose Vampire from Super7 is one of my all time favorite vinyl figures, so you know I’ve been really looking forward to seeing the final painted version of this intricate character. I think Medicom did a great job transforming Josh’s painting into a 3D form, and I really like the all of the little details on the Earth Wolf's head and chest. The Project 1/6 Exclusive Earth Wolf vinyl figure is currently available for pre-order directly from Medicom here for $115, and is scheduled to ship in July 2011. Get one while you can! The first X-Men: First Class international one sheet movie poster was released last week, and sadly it’s more of the same. I don’t know why, but The Blot keeps expecting these posters to get better…and then Sony puts out more photoshopping disasters. I guess I’m just a glutton for punishment! What’s worse is the poster itself is pretty cool. I like the tagline “Witness The Moment That Will Change Our World” and that the poster features all of the film’s principle cast, but something about each actor looks off. What really bothers me is that James McAvoy’s (Charles Xavier) head/neck looks weird. On second thought, Michael Fassbender (Magneto) and Jennifer Lawrence’s (Mystique) heads look weird too. You’d think they’d put a little more effort into photoshopping the film’s main characters before they released a big summer blockbuster’s media campaign. But I guess that’s too much to ask for! Any chance they put out a decent poster before the film hits theaters? 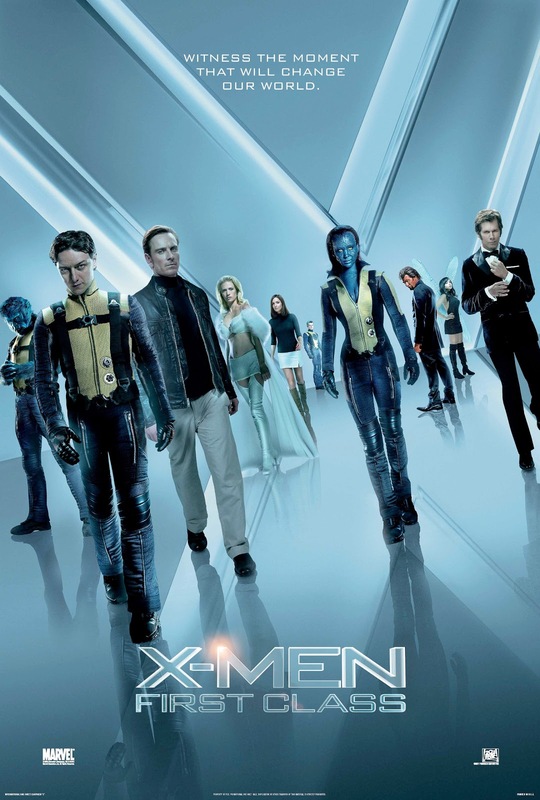 X-Men: First Class is directed by Matthew Vaughn is scheduled to debut in theaters on June 3, 2011. 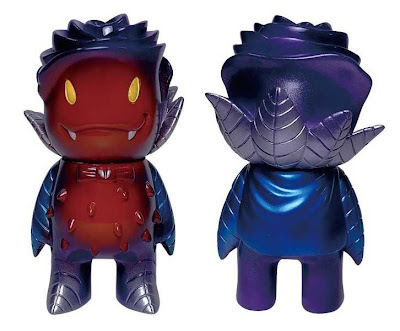 While we all knew Josh Herbolsheimer was working with Medicom on his upcoming Earth Wolf vinyl figure, no one knew he and Super7 would also be releasing a Project 1/6 exclusive Rose Vampire with the Japanese toy company! The Fake Ragon Rose Vampire is a beautiful colorway featuring dark blue, red yellow and silver sprays on purple vinyl. 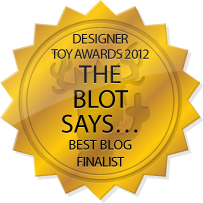 The Blot's not sure how I'm going to get my hands on one, but you know I'll do my best! This Project 1/6 Exclusive Fake Ragon Rose Vampire can be purchased here for $36.50, but it will only be sold to residents of Japan. So to all you Rose Vampire completists out there, good luck hunting down one of these amazing figures! I have to face an ugly truth. Jerry Whittaker, my own father, is anti-awesometic. under 20 years of lawnmower parties and carpool bar-b-qs. 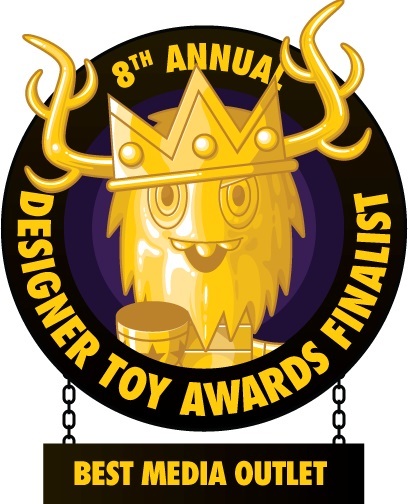 Toy Street takes place today, Friday, April 22nd, from 12-8pm in New York City, and Argonaut Resins will be there with The Jelly Empire and some very cute Jelly Bot/Tuttz Mini resin figure sets. Each set will go for $40 each and 3 of the matching sets will include a Kings of Atlantis Talisman skull magnet for FREE! The orange and green sets are Zombie Glow GID, and the uber chase clear tint gray WereWolf Jelly Bot and matching Tuttz Mini are also Zombie Glow GID! The cool yellow gold set with orange polka dots, The Blot’s personal favorite, are Selina Brigg customs. 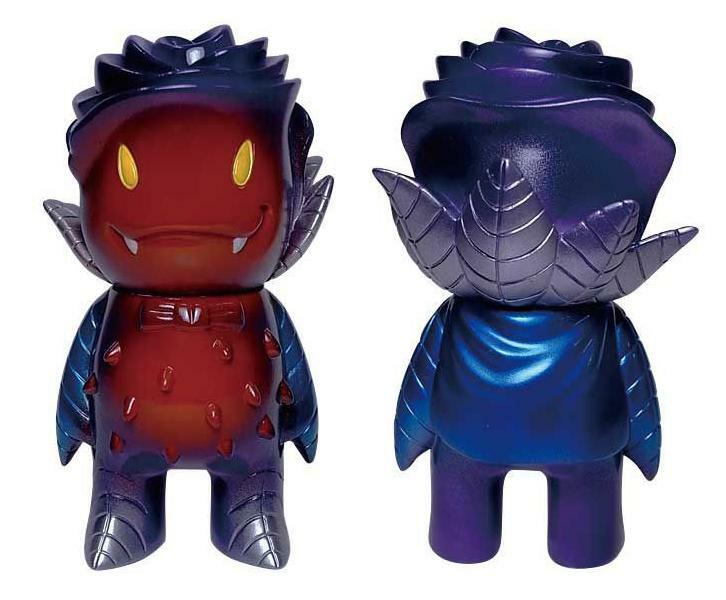 END will also be some individual Tuttz Minis on sale at Toy Street, but be sure to get there early because these will sell out! The first Sketchbot colorway of 2011 (and third overall) will be released this Friday, April 22nd, at Toy Street in New York City! Steve Talkwoski’s third Sketchbot variant sports a popping, semi-translucent magenta tint and includes an ink pen accessory and matching sticker. 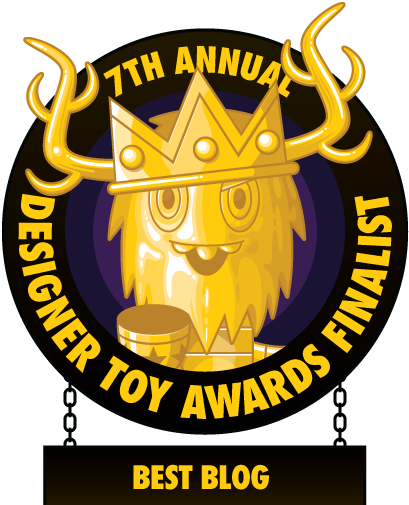 Steve and his popular creation will be at Toy Street from 12-8pm, and then the Magenta Sketchbot vinyl figure will be released to the world just a week later. The Sketchbot Magenta Variant by Steve Talkowsky stands 5 inches tall and has 6 points of articulation. Look for one of these artistic vinyl figures in a designer toy store near you soon! 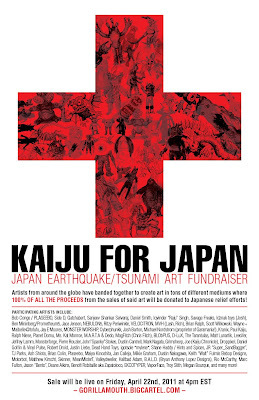 Kaiju for Japan Fundraiser Goes Live Today! 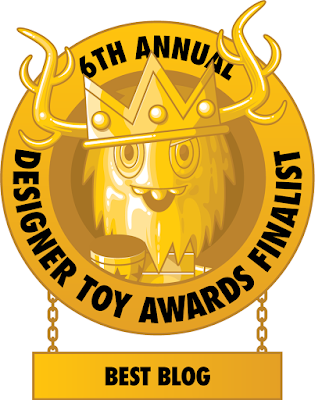 There are some really big things going on in the world of designer toys today! If you live in the New York area, you can hit up Toy Street at 268 Mulberry Street, but the event I’ve really been looking forward to is the Kaiju for Japan fundraiser organized by Troy Stith. 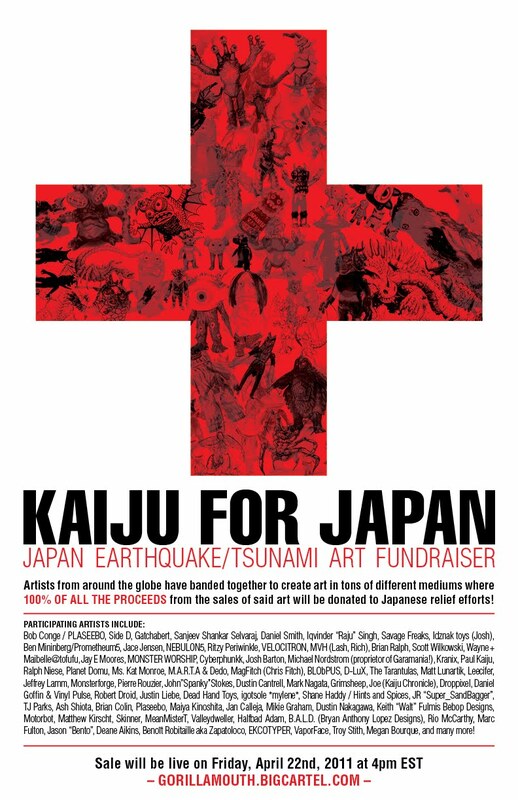 Some of the biggest names in the toy game have donated rare toys, one offs and customs to be sold later today, with all proceeds from the Kaiju for Japan sale donated to the Red Cross Earthquake/Tsunami Relief Fund. Here are the details on the Kaiju for Japan Sale: the sale goes live today, Friday, April 22nd, at 4:00pm EST. Many of the items are still unknown, but from what I’ve seen there is some crazy good stuff for sale. The sale will be taking place at the Gorilla Mouth online store, which won’t go live until 4pm, so warm up your F5 keys and start refreshing now! How many opportunities do you get to buy toys all in the name of raising funds for a good cause? 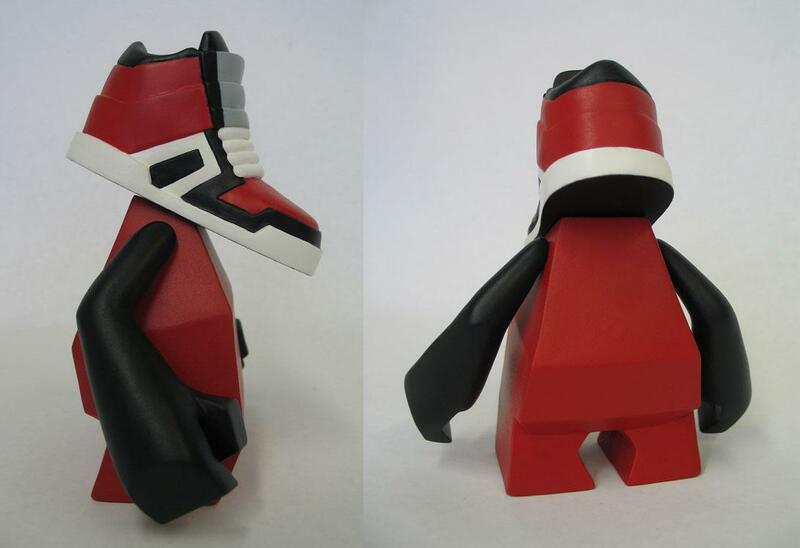 Cookies-N-Cream will be debuting the first colorway of their brand new Sneakerhead designer toy this Friday at Toy Street! Designed by Cookies-N-Cream and sculpted by END of Argonaut Resins, the OG Sneakerhead is going to be the must get toy of sneakerheads everywhere. This colorway should be particularly interesting to sneaker fiends as it is inspired by one of the most popular sneakers ever produced, Nike's classic Original (OG) Air Jordan 1s. If you live in the New York City area, be sure to stop by Toy Street this Friday, April 22nd, from 12-8pm to check out this exciting new figure in person. And if you're planning to attend Toy Street, be on the lookout for some awesome Sneakerhead customs by some really top tier talent! As The Blot counts down to Booster Gold’s world television debut in this Friday’s episode of Smallville (appropriately entitled “Booster”), I thought I’d share a photo of my Booster Gold toy collection. The Blot’s proud to say I own every Booster Gold figure ever produced, and here they all are in one fabulous group shot. To be honest, owning every Booster Gold figure is not quite the same accomplishment if say I collected Superman or Batman figures. With the amount of toys made of DC Comics’ A-list characters over the past 80 years, it’d be nearly impossible to have a complete collection. I guess that’s just one of the few perks to having your favorite character be a C-list hero. That and none of these figures are all that rare (except maybe the Walmart Exclusive DCU Infinite Heroes action figure in the middle). For those interested, here’s a key to the Booster Gold figures you see in the photograph above (from left to right): Lead Figure by Eaglemoss Publications, 52 action figure by DC Direct, Heroclix figure, JLU action figure, DC Universe Classics action figure, DC Universe Infinite Heroes action figure, Minimates action figure, DC Universe Infinite Heroes action figure, JLU action figure, JLI action figure by DC Direct, and two more Heroclix figures. Houston’s own Grits Apparel released its newest t-shirt collection yesterday, and The Blot loves them all! Entitled The Nitty Gritty Series, Grits’ Spring 2011 collection features 5 new designs including a collaboration with Houston based Hater Magazine entitled “Wake-N-Bake.” I think it’s safe to say it was no coincidence this collection was released on 4/20 with a design like “Wake-N-Bake” included! What I like most about this release is that there’s a little something for everyone in it. My personal favorite is the “Grits Co.” t-shirt, which is dedicated to Goode Company BBQ, a popular local Houston restaurant. Their motto is "You might give some serious thought to thanking your lucky stars you're in Texas," and you know what? They’re right! The Nitty Gritty Series by Grits Apparel is currently available from the Grits online store. Each shirt retails for $26 (except the "Wake-N-Bake" design which is $30) and comes in sizes XS-XXXL. Grits always stays cooking, and these tees are definitely “Fresh n' Hot Straight out the Pot!” But act quickly, because certain sizes have already begun to sell out. This Friday at Toy Street Tenacious Toys will releasing a very special custom series by one of The Blot’s favorite artists, OsirisOrion. This isn’t your run of the mill collaboration, Benny of Tenacious Toys sent OsirisOrion four dozen of Buff Monster’s mini Ice Cream vinyl figures to be customized for this very special release. Yes, you read that right…four dozen! The OsirisOrion x Tenacious Toys Custom Buff Monster Mini Ice Cream Series includes four different shaped vinyl figures, with each shape featuring its own unique Osiris-style colorway. From left to right they are Sewer Sludge, Oil Slick, Molten Lava and Rainbow Cookie. The OsirisOrion x Tenacious Toys Custom Buff Monster Mini Ice Cream Series includes 48 figures in all and can be purchased at Toy Street from the Tenacious Toys table for just $25. Osiris will also be on hand Friday for a very special signing event at the Tenacious Toys table. The Blot recently snagged my first OsirisOrion custom and let me tell you, his paint jobs are as beautiful in person as they look in pictures. This is definitely one custom series you won’t want to miss! If you haven’t been able to tell by from posts over the past few months, The Blot’s been on a big resin kick lately. While production vinyl figures are nice, there’s something about the handmade nature of resin figures (and of course customs figures too) that I’ve really come to appreciate. 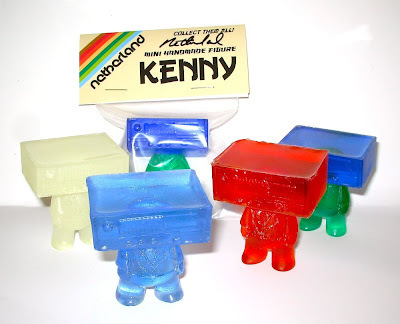 The newest resin figure that’s drawn my attention is Kenny by David “Netherland” van Alphen. Featuring Netherland’s trademark retro analogue stereo head on a human body, Kenny stands 2” tall, is made of translucent resin, and comes packaged in a signed header card. The Blot’s really digging this Kenny resin figure, and at $12 each it’s a freaking steal! It even comes in 6 different colors including GID (glow in the dark), blue, red, green, blue/green, and red/blue. Pick one up from the Netherland Studios online store while supplies last! Before I totally lose all of my non-comic book loving readers, check out these new photos from Comic Book Resources showing Jaden Brandt Bartlett as Jaime Reyes (aka the Blue Beetle). 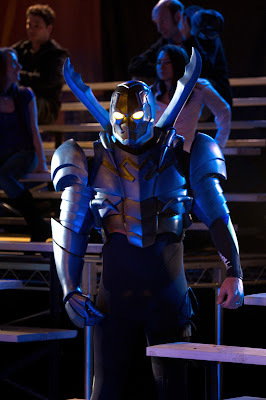 For as much as I love Smallville’s Booster Gold uniform, I equally hate the Blue Beetle armor. It just looks hokey and cardboard-y. To be honest, I’ve seen better and more realistic costumes at SDCC. 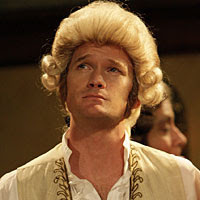 But hopefully these still photos aren’t indicative of how the costume looks on tv. 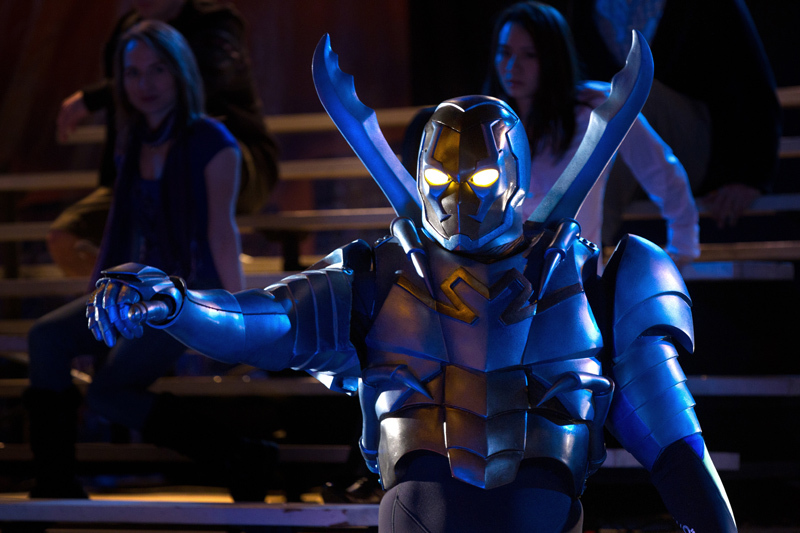 For those of you interested in what the Smallville episode “Booster” will be about, here’s the official synopsis: DC Comics character Booster Gold arrives from the future; The Blue Beetle is born! — After everything that happened with the VRA, Lois (Erica Durance) tells Clark (Tom Welling) it’s best to make “Clark Kent” forgettable and awkward so people don’t suspect he’s The Blur. However, the two are stunned when a fame-hungry superhero from the future, Booster Gold (guest star Eric Martsolf), sweeps into town and begins making saves and posing for press ops, completely winning over the city of Metropolis. Booster begins his campaign to take The Blur’s place as the “World’s Greatest Superhero” and tries to charm Lois into writing a story about him, but she’s not having his antics and begins her own campaign for The Blur. During one of Booster’s saves, an alien weapon in the form of a scarab falls from a truck and fuses itself to a boy named Jaime Reyes (guest star Jaden Brandt Bartlett), turning him into the Blue Beetle. 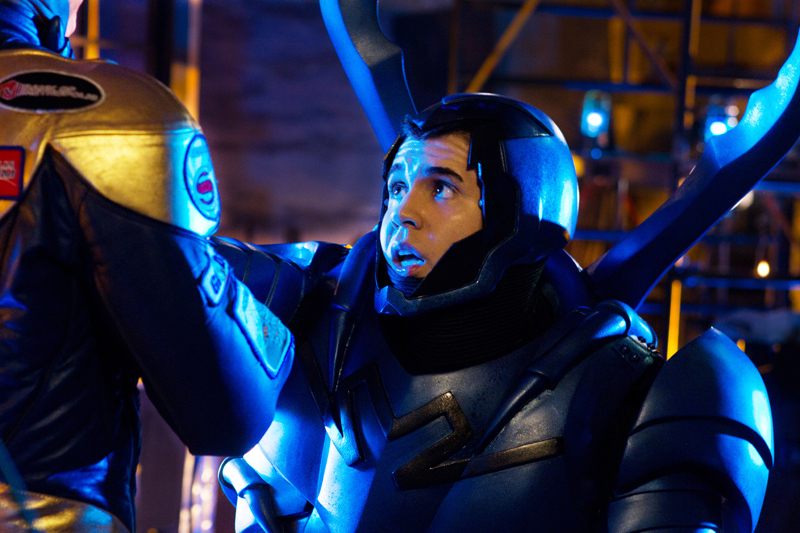 Unfortunately, Jaime is unable to control the suit and Blue Beetle starts attacking Metropolis. Tom Welling directed the episode written by Geoff Johns. 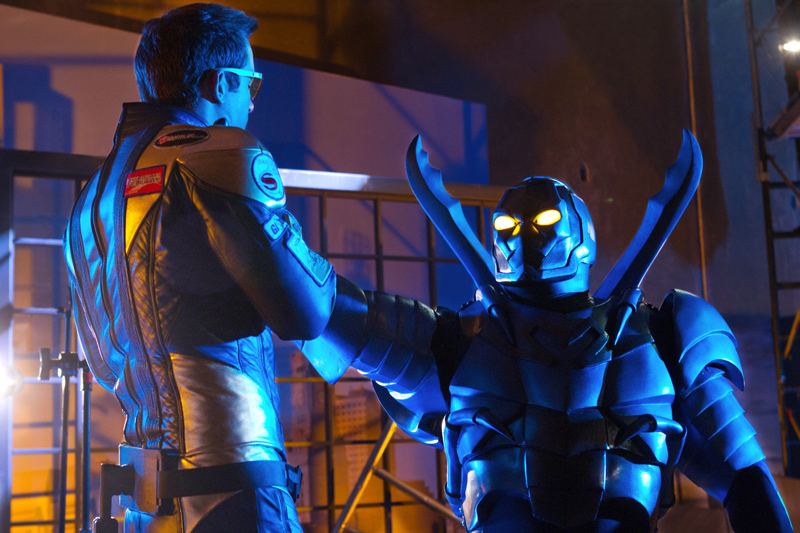 The Smallville episode “Booster” premieres this Friday, April 22nd, at 8/7c on The CW. This is one of those releases The Blot’s been looking forward to for months! A while ago OsirisOrion let it slip on Twitter that he was working on a special collaboration with Skinner and Deadbear Studios (aka Motorbot), which to The Blot could only meant one thing…The Outsider! The Outsider was one of The Blot’s favorite sculpts from 2010 and I knew Osiris could do something really special with this articulated and highly detailed resin figure. Osiris finally unveiled what he’s been working on all this time, and he definitely didn’t disappoint with this four figure set of Oil Slick Outsiders. Osiris’s oil slick design is definitely my favorite of his trademark (and quite unique) colorways, and I think it actually adds to the depth of The Outsider’s sculpt. I honestly didn’t think you could make The Outsider’s body look any crazier, but Osiris did it! 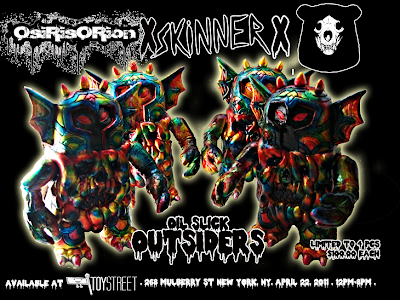 The Oil Slick Outsider resin figure by Osiris Orion has a limited edition run size of 4 figures, and goes on sale this Friday for $100 each exclusively at Toy Street. 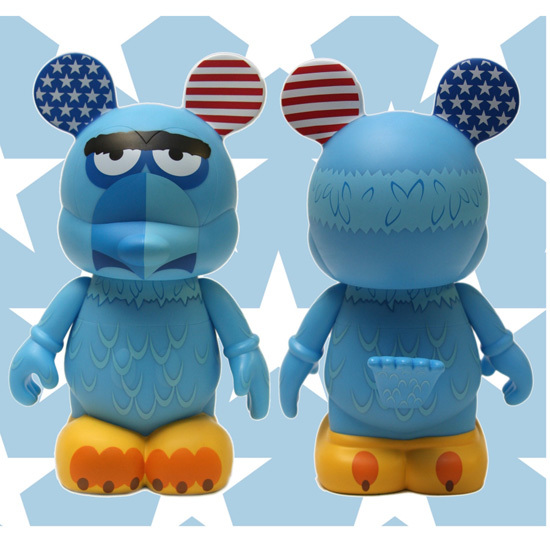 The Blot is seriously jealous of the 4 lucky collectors who add this great collaboration to their collection. This Friday, April 22nd, a very cool toy-centric event called Toy Street will be taking place in NYC. Put on by Cookies N Cream, Toy Street is a one-day event from 12-8pm at 268 Mulberry Street in NYC. 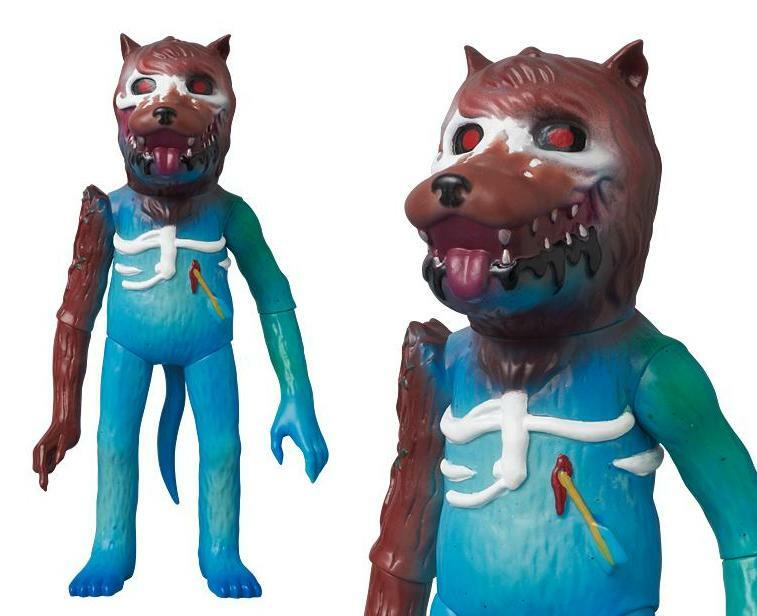 Tenacious Toys will be on hand with a number killer exclusives, including this crazy looking figure from Halfbad Toyz. The Pearl White Skekiltor resin figure stands 4.5” tall and can be purchased exclusively from Tenacious Toys at Toy Street! Skekiltor is an incredibly detailed figure, whose sculpt is really highlighted by this pearl colorway. The Tenacious Toys Exclusive Pearl White Skekiltor has a limited edition run size 20 figures and will retail for $18 each. If you live in the New York area, be sure to hit up Toy Street this Friday and stop by both the Tenacious Toy table and the Halfbad Toyz table while you’re there. This is a huge week for The Blot, because it marks the world television debut of the Smallville episode “Booster” featuring my all time favorite DC Comics superhero, Booster Gold! 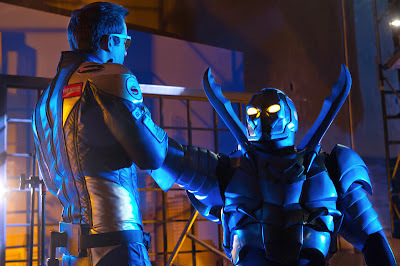 With only five Smallville episodes left, The Blot’s still in shock that an entire episode would be dedicated to introducing Booster (and of course the Blue Beetle) to the world of live action TV, but I couldn’t be happier. The costume looks great and from what I’ve seen, I think Geoff Johns did a great job adapting this C-list hero for television. But don’t take my word for it, check out the official preview for this week’s episode for your official first look at Booster Gold in action! While The Blot’s not fan of Smallville, I can’t get over watching a real live version of Booster Gold. If the episode is anywhere near as good as the promo video clip above, I might have to go back and watch the show's first 9 seasons! Watch for other Booster related posts all this week on The Blot Says... as a lead-up to the character’s big Smallville debut. The Blot’s going to try to keep this post short, because anything I could write would do this amazing custom by Marka27 an injustice. 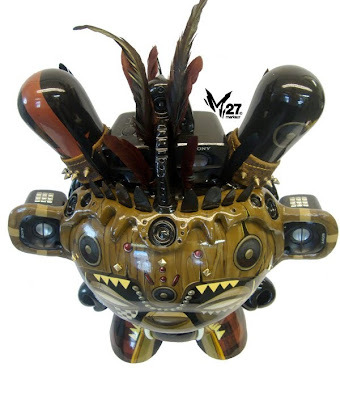 This 20” Dunny is just plain incredible! 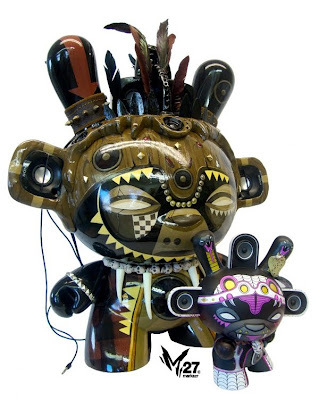 Marka created the custom above for his signing at Kidrobot NY this Thursday to promote the release of his first 8” Dunny, the Shadow Serpent. The 20" African Minigod Dunny was inspired by African warriors and African face masks, and can be seen at Marka’s signing on Thursday, April 20th, from 6-8pm at Kidrobot NY. For those custom aficionados, this 20" custom feature features 4 full range Sony speakers, hand sculpted details, pyramid studs, leather bands with brass spikes, a skull necklace and feathers. It was created with acrylics and spray paint, with a clear varnish finish. 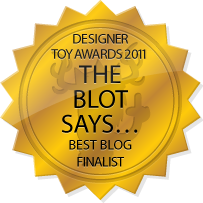 The Blot recently discovered Redline Toy Company on Twitter and was shocked to learn this fledgling resin toy studio was also based in Houston, Texas! The Blot’s always excited about meeting new artists, especially when they live in my own backyard. 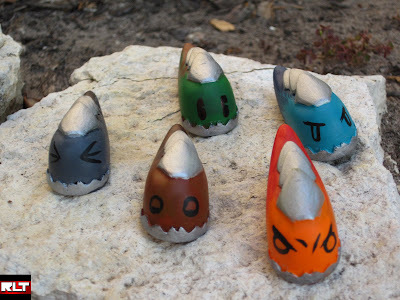 RTC’s first release is the Mini Elemental Slug resin figure by Travers Cooke. There are 5 hand painted Slug colorways in all, with each color based on one of the five elements of nature: Earth, Fire, Water, Wood & Metal. According to Travers, “the Slugs are hidden inhabitants. They corrode and decompose all that they touch. When they consume something their bodies create a chemical reaction that removes all of their respective element from said object. They consume everything and their only nemesis is Zako of Creation,” who also happens to be RTC’s next scheduled release. The Mini Elemental Slugs by Travers Cooke go on sale this Wednesday, April 20th, at 1:00pm CDT at the Redline Toy Company online store. RTC has produced 8 Slugs in each colorway, for a limited edition run size of 40 figures in total. Each slug will retail for $7, or you can pick up the entire five Slug set for $25. Solicitations for Mezco Toyz’ DC Universe Mini-Mez-Itz Series 2 hit the internet this past weekend, and the line-up was surprisingly different from the one we saw at Toy Fair 2011. Instead of the Batman Beyond villain Blight, Terry McGinnis will be packaged with Cyborg. While the pairing itself doesn’t make sense (Beast Boy anyone? ), I am really glad to see Cyborg included in the toy line. Plus, I think this gives the Batman Beyond 2-pack a little more appeal to the casual collector. 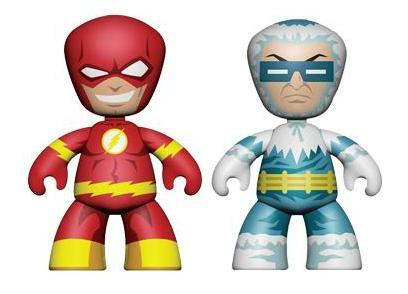 DC Universe Mini-Mez-Itz Series 2 is made up of three 2-packs, The Flash and Captain Cold, Batman Beyond and Cyborg, and Doctor Fate and The Demon. It’s refreshing to get an early wave of figures made up almost entirely of B and C-list characters, The Blot just hopes they sell!!! Mezco’s DC Universe Mini-Mez-Itz vinyl figures stand 2 inches tall, feature five points of articulation and will be packaged in 2-packs together on a blister card. 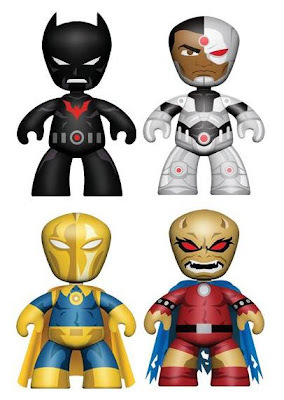 While DC Universe Mini-Mez-Itz Series 2 is not scheduled to ship until October 2011, you can pre-order each 2-pack for $10.99 here or all three 2-packs of Wave 2 for $29.99 from Entertainment Earth here. Now this is the Disney Vinylmation series The Blot’s been waiting for! 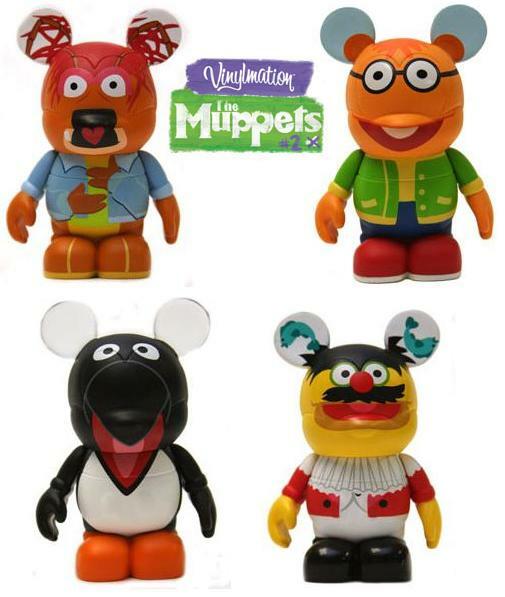 After months of teasing a second release, Disney finally unveiled the line-up of The Muppets Vinylmation Series 2. 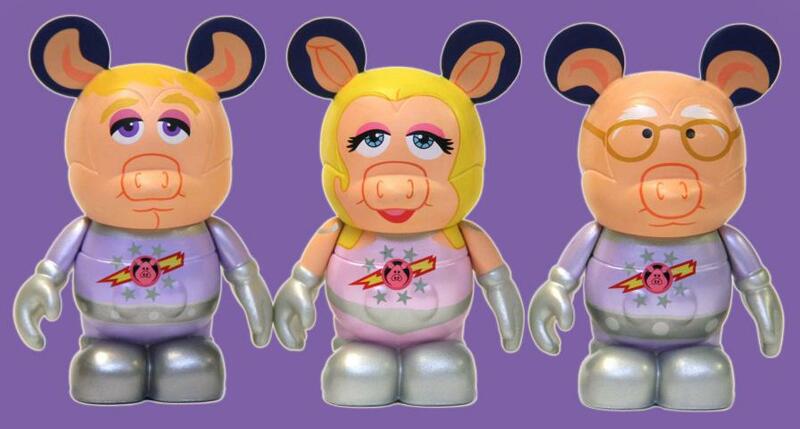 Best of all, it includes all five original members of The Electric Mayhem and the Pigs In Space crew! 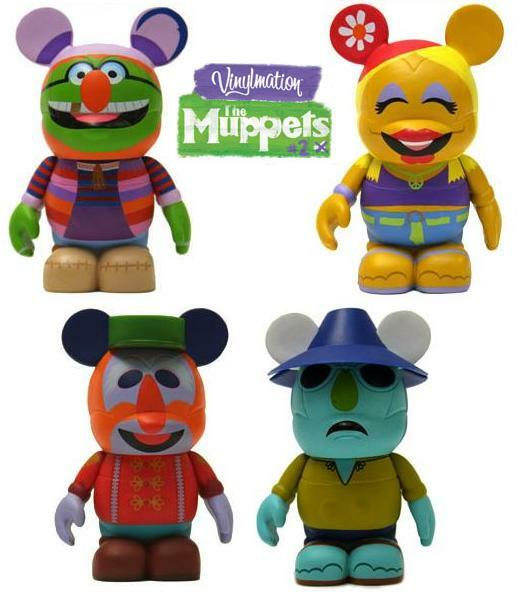 The Electric Mayhem was my favorite band as a little kid, and I love seeing Dr. Teeth, Janice, Floyd, Zoot and Animal make their Vinylmation debut. The Muppets Disney Vinylmation Series 2 features eleven 3 inch blind box vinyl figures and four 9 inch window box figures. The 3” figures include Pepe the Prawn, Scooter, Dr. Teeth, Janice, Floyd Pepper, Zoot, Captain Link Hogthrob, First Mate Piggy, Dr. Strangepork, Penguin & Lew Zealand. Yes, you read that right...Disney even included the boomerang fish throwing Muppet Lew Zealand in Series 2. All we need now are Beauregard and Crazy Harry in Series 3 and The Blot will be in Muppet heavan! The Muppets Disney Vinylmation Series 2 9” figures include Kermit with 3-D glasses, Animal with a drum stick, Gonzo with a 3” Camilla the chicken figure, and Sam the Eagle. 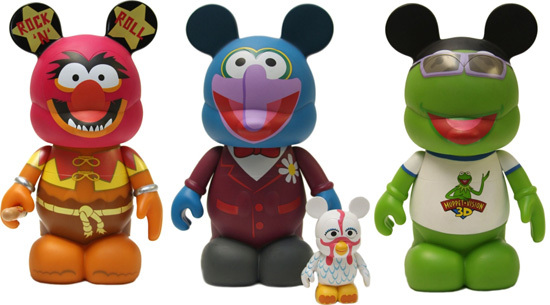 All four of these figures look great, but The Blot especially loves the Gonzo/Camilla 2-pack. I’m definitely going to have try and hunt that set down. Hopefully there will be a Series 3 so we can get 3” versions of Animal and Gonzo. The Muppets Vinylmation Series 2 went on sale April 15th at Disneyland and Walt Disney World, but there’s been no word on whether this series will be available online or at Disney Stores across the US. The 9” figures have not been released yet, but they should be hitting store shelves sometime soon.